Jesus and His disciples had been ministering as they travelled south in the direction of Jerusalem. Jesus stopped at the house of Martha in Bethany, about two miles from Jerusalem. 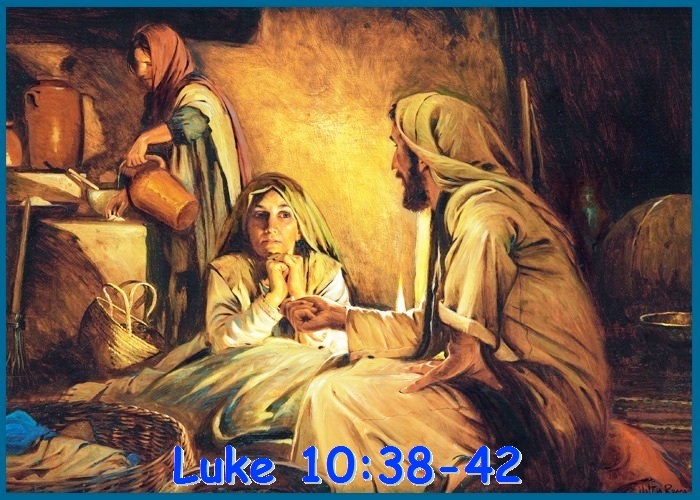 Her sister Mary lived there, along with their brother Lazarus, whom Jesus had raised from the dead. “Jesus loved Martha and her sister and Lazarus” (John 11:5). Martha, Mary and Lazarus always had their home open to Jesus and are remembered for their hospitality. Martha was showing typical hospitality of that culture, when she opened her home to Jesus, who was their long time friend. Sitting at someone’s feet was the usual posture of a disciple who was being taught. The key point of this passage is that Mary made Jesus and His word her first priority. Martha being the oldest had the tendency to take charge. She worried about details and she wished to please Jesus, but in doing so, she found it hard to relax and enjoy her guest’s visit. It was even harder for her to accept Mary’s lack of cooperation in all the preparations. Martha’s frustration was so intense that she finally asked Jesus to settle the matter. She commands Jesus, “Tell her to help me!” Martha is telling Almighty God what He should do. Her anger and frustration have taken over. Martha is angry and she is rude to her honored guest. Mary probably had been helping in the preparations of the meal at some point. But as soon as Jesus arrived, she made a choice to go and listen to Him. She knew that every word He said was precious and time was short, since He had spoken of His imminent death. He commended Mary for choosing the good part, the Holy Word, truth and faith in Jesus Christ, which will never be taken from her. Because, there are so few things in life that really matter, it is vital that we concentrate on those things that will last for time and eternity. We should follow Mary’s example and desire God’s truth above everything else. The important thing to note is that Martha like Mary could have also chosen to sit at Jesus’ feet instead of being worried about impressing her guest. When Jesus is the focus of our attention everything will be resolved at the right time. Martha and Mary were both devoted disciples of Jesus (John 11:24, 27). Too often, however, we are like Martha and are too busy with the world to focus on what is really important in life. We need to take the opportunities that the Lord offers us while there is still time, otherwise we are saddened when we realize the opportunities that we have missed. Remember, Jesus told us to “seek first His kingdom and His righteousness, and all these things will be given to you as well.” (Matthew 6:33) That’s what Mary did, she sought Jesus first and that is what we should do also. So, the question is? Do we have our priorities in order? Are we worried or anxious about many things, or are we focused on Jesus? Have we put our devotion to Christ and His word first, or are we more concerned about doing good deeds to impress others? This is good. And just what I needed today. Thank you for your ministry.